livin' the dream: 11 years....Yeah, It seems that long. January 3rd marks 11 years of wedded bliss. And really it seems like that long! Because I can't imagine life without him. I can hardly remember how it was to know him in a dating kind of relationship. I have no idea how it was when we didn't have kids. Sleeping in every Saturdays???? Getting only yourself ready in the morning? Making meals for 2? Seems like a 100 years ago. I look forward to the next season of our life, living past the diaper and getting up at night stages....moving into everyone going to school. More parent/teacher conferences. Our first teenager coming up in 4 1/2 years. Watching our Suzy go to Kindergarten. Anticipating Jack in braces in the years to come. Wondeirng how William will adjust to going to school. Watching in wonder as they all grow up so fast. Loving the ride of my life with my best friend, my husband. Who understands me in such a complete way. When we fight, he's learning to give me space. Until I come around to wanting to talk. I'm learning to admit I'm wrong. Which is very painful to be honest. This morning I was telling our oldest, Isabella about what I was doing 11 years ago today. How I was decorating & getting ready for our candlelit wedding coming the very next night. 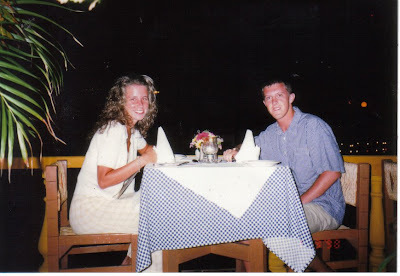 And after our wedding how we flew to Ixtapa, Mexico for our honeymoon. I was reminiscing of our hotel tucked into this authentic part of Mexico with the most amazing service. 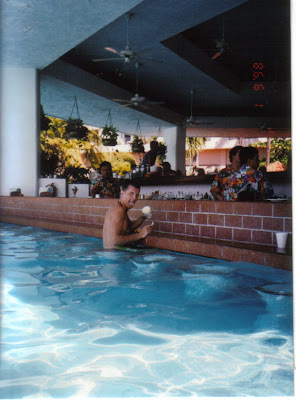 A swim up bar that served vanilla bean ice cream with flecks of vanilla beans harvested right there in their town. It was so amazing. After ice cream, then laying in the sun. While laying by the pool the hotel staff had little Mexican girls bring cold wash clothes scented with flowers and arranged beautifully on a platter with fresh cut pink little flowers....Just to cool us off. The weather was so perfect that week. It was an amazing memory of getting to know my new husband in a new way. Go to the open market. Watching Donovan para sailing, thinking he will probably crash, & I might have to fly home from our honeymoon by myself. Sleeping as late as we wanted, eating out every single day. Finding new restaurants and trying to order with knowing very little Spanish, in a town that knew very little English. What a memory! 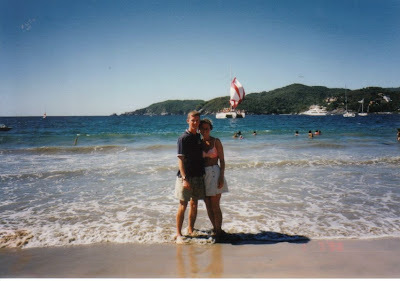 I hope someday we can revisit Ixtapa. Until then I live with the memory, and realize how very much we've been blessed. I feel God's hand in this family. I'm so very thankful for all these things that I don't deserve. All these things God orchestrated with his wisdom. Giving me things at times in my life when I had no idea of his whole plan for my life. Dealing me things that I was devastated by, later learning a lesson in God's perfect ways. Sometimes this took a year to see - sometimes several years. WOW is all I have to say. God has been so gracious to me. I'm so thankful for Donovan, my husband and best friend. Suzy (the 2 year old) : "Daddy, you have big ears?" Suzy: "I like your big ears daddy." Happy Anniversary, Heather and Donovan. This is a very sweet post. I hope you have many more years of happiness together. Happy Anniversary. What fun memorys. I enjoyed reading this sweet post!! Congratulations Donovan & Heather!!! I still remember when you were dating!..... It seems like yesterday! I have lots of memories of ya'll and it's all good! Now look at you and your beautiful family! God has truly blessed you! Happy Anniversary! I remember your wedding well. I didn't know you at all but I could tell Don had found himself an excellent partner. Congratulations! hey Heather...Happy anniversary...I'm so glad you have each other! You deserve each other...and I mean that in a good way! :) You're great together and your great parents! Have an amazing day! Hope your day is filled with happy times today! Happy Happy Anniversary you two! God made a perfect match! What a nice blog about you & your hubby! You 2 both are so very fortunate to have each other & 4 amazing kids! I am so happy for you! Sweet post! Congrats!!! 11 years is a long time. Continue to cherish each memory and be thankful for the great marriage you have. Congratulations to the 2 of you! Blessings as you look forward to many more years! Hey this blogger is back Heather! Congrats on the big 1-1! Celebrating with you! Memories of visiting you at the B & B ... has it really been that long ago? Only about 5 more months until we open the pool ... please tell me that's really not that long!